Seven days proved to be the perfect break for Burgonet before his narrow win at Sandown. Burgonet improved significantly from his first-up run to his second outing this time in when second at Sandown on January 16 before returning to the same venue for the Clanbrooke Racing Handicap (1400m) a week later. While Burgonet had only a week between runs, he impressed trainers Mathew Ellerton and Simon Zahra with his improvement in that period before the four-year-old justified their faith with a strong win. Jockey Damian Lane sent Burgonet straight to the front before going for home halfway down the straight. The son of Helmet did enough to get home ahead of a determined runner-up to get home by a long head. 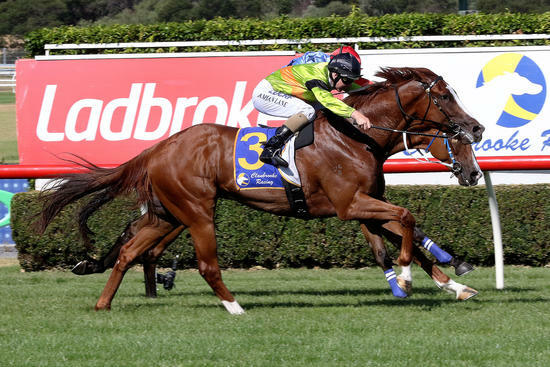 “He probably stripped a bit fitter and was better in himself this week,” Ellerton said. Ellerton said racing among horses was not Burgonet’s thing at this stage of his career while he can switch off when he gets to the front. However, the trainer said Burgonet could notch a few more wins if he matured in the coming seasons. “He’s gets in among them and he’s not that genuine and he gets to the front and he idles and has a good time of it so I think he’s got a few more wins up his sleeve,” Ellerton said. Burgonet also won at the third run of his last campaign when he scored at Sale in August last year before taking his record to three wins from eight starts with his Sandown success. Burgonet earned a $27,500 winner’s cheque for his efforts, taking his stakes tally to more than $70,000. Congratulations to Burgonet’s owners on another win with the developing galloper.